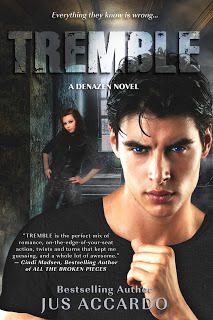 Review: Tremble by Jus Accardo | Book Lovers Inc.
Once again, Accardo has thrilled me with an amazing continuation of this story. Dez’s life seems to just keep going from bad to worse. The Supremacy illness is bearing down on her, Kale has once again been imprisoned by Denazen and now he’s been ordered to capture and kill her. Dez finds herself in a race against time because if Kale doesn’t kill her, her illness will. Dez as always is amazing, her character is growing in small ways, but she is still the Dez we met in Touch; tackling things head on, letting her emotions run away with her and sometimes getting her into a bad situation, and always diving head first into trouble with her shoot first ask questions later attitude. Dez refuses to give up on Kale even though he can’t remember who she is, she fights to be let out into the field in search of the cure for Supremacy and not let anyone walk into danger she isn’t also walking into and she never misses an opportunity to dish out insults and snark where they are not always needed. Kale’s character in Tremble is still a little iffy with me. In Toxic I was dissapointed in him because he still doesn’t seem to grasp social niceties – or the fact that when in a relationship you don’t kiss anyone else. In Tremble his memory has been wiped, he has been told by Marshall Cross that Dez is evil and has tried to kill him on many occasionsand his real girlfriend “Roz” (played by someone who looks like Dez) is the love of his life. Kale redeemed himself a little with me because once he started to realise that something wasn’t right he did try to fight against his muddled mind, the new Kale is also a little more devious than the old one, he never would a have let Dez walk into danger before but this time he encouraged her to use her power to help break into Denazen instead of trying to hide her awayand protect her. What some people are calling cheating, I see no reason to be up in arms about, during Tremble Kale was brainwashed and when he woke up with no memories he had someone shoving a very familiar looking girl in his face naming her his girlfriend, it’s understandable that he believed that. When he did finally catch up with Dez on his mission to terminate her she sparked the change in his brain to signal that something was wrong. Accardo’s writing is engrossing, from start to finish. Her ideas are unique and the perfect blend of action, angst and romance means my eyes never wander and my mind never strays from the story. Her characters are believable and although it’s not always the easy path in the story, stay true to form which is one of the things I love about this series apart from the awesome creativness around the sixes. Whatever other people are saying, I absolutely loved Tremble, and as seems to be standard with this series now, we were left with another bombshell of a cliffhanger which amazed me because i thought this series was a trilogy. I cannot wait for the next installment in this series. I need it. Now.